Alex Nahas from the Brooklyn NY band Bright Brown, was a guest on Peter Turner’s “Blind Hope Radio” this past Thursday and featured an awesome performance playing a Chapman Stick. (The Stick) is an electric musical instrument devised by Emmett Chapman in the early 1970s. 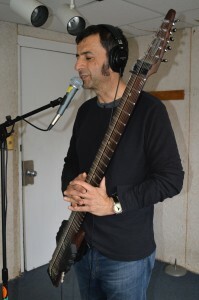 A member of the guitar family, the Chapman Stick usually has ten or twelve individually tuned strings and has been used on music recordings to play bass lines, melody lines, chords, or textures. Mixing bittersweet layers and textures abound, and beautifully crafted songs it was a wonderful show. Click here to listen to the entire performance!